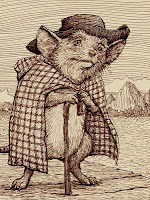 David Petersen: Christian, very glad to get the chance to share your work with the Mouse Guard fans. Let’s start with you explaining who you are and about your book Korgi. Christian Slade: I am an artist like many in the field of comics. I was born in 1974. My childhood was spent swimming in the inspirations of comic books, Star Wars, comic strips, childrens books and animated films....basically anything that gave off a strong visual sense including people, places and things in real life. These things still continue to motivate me. 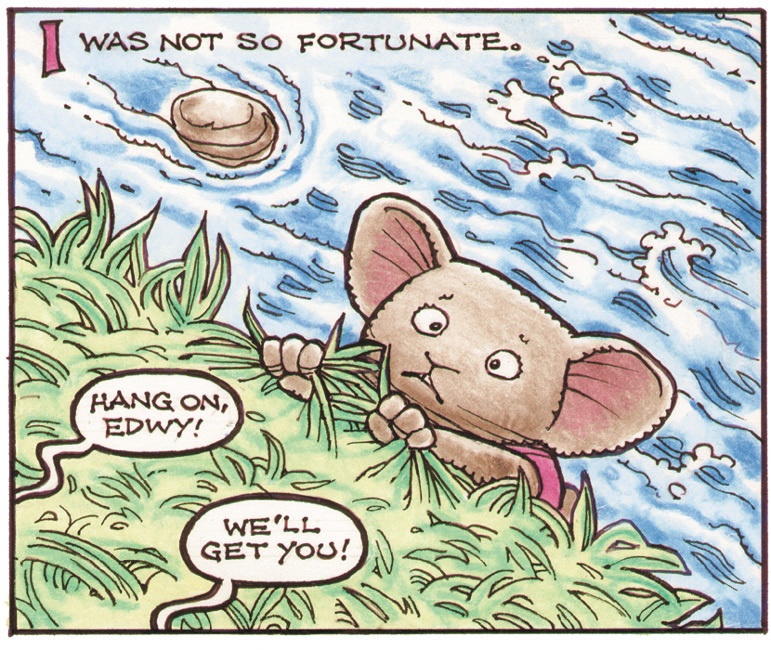 Korgi is my all ages graphic novel series published by the wonderful folks at Top Shelf Productions. 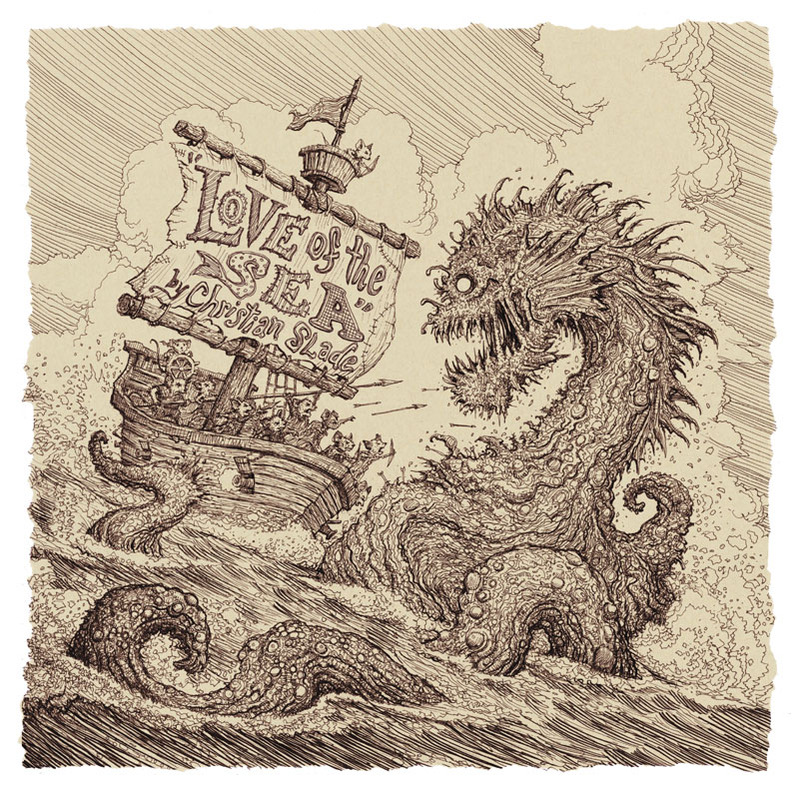 It is a silent story told only with highly detailed pen and ink drawings. David: What was your artistic background? Were you always drawing? Did you know even at a young age that art had to be your career? Christian: As with many artists, I consider this field a calling. I knew from as early as I can remember that I wanted to draw and make pictures every day of my life. I have drawn or looked at things as drawings as long as I can remember. David: I know you started in animation before launching your creator owned book Korgi. Was animation for you, or did you switch to comics because of the traditional animation industry shrinking? Christian: I started in animation but before that, I started in book illustration which is my primary workload these days. 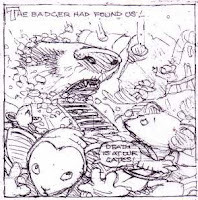 I approach comics kind of like book illustration, only, they are told with more pictures. I love animation and still work in it occasionally I have also been involved with magazine illustration, theme park design, advertising campaigns and still love working in my sketchbook and doing plein air painting. Basically, I will go to wherever the art party is. As long as I can express ideas through drawing and painting...I am there!! David: Do you feel your animation background helps inform you on making comics? or does it sometimes get in the way when you can’t show movement or the passage of time on the page the same way as in animation? Christian: The way I see it, animation and comics are brothers. There are more similarities than differences. Both are the sequential arts. Both have artists that do both mediums. I kind of see animated films as a moving comic on the screen with music and sound. I would say that comics offer a bit more freedom and immediacy. One person can create a comic on their own in a relatively short period of time. A quality animated film often takes many hands in a group effort over a good stretch of time. David: Korgi is an all ages book (with no dialogue so even pre-readers or learning disabled children can follow with no language barrier) Is that who you are at your core as a storyteller? or did you plan out that Korgi needed to stay within certain storytelling age-borders? David: Do you ever feel restricted by either the tone or wordless aspect of Korgi? Do you ever have ideas that you have to discard because they don’t fit because they are too dark or would need language to narrate them? Christian: I do not feel much restriction with silent storytelling. In a way I find it liberating to just tell things through drawings. I consider drawing a language so if I properly think things through in sketches, I can say anything I want. As long as I can draw it, it can be told. David: When doing a comic without words, do you have any type of script? or is it an outline? And describe the process of breaking it into pages and deciding how much of the story goes onto each page. 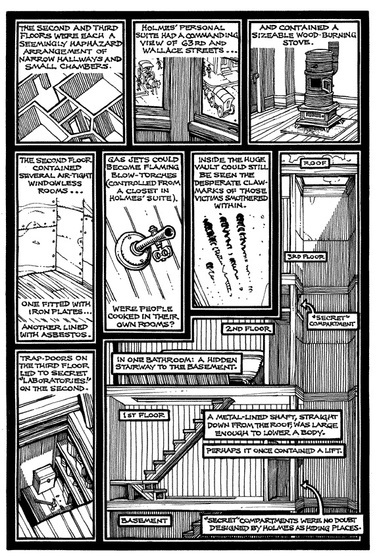 Christian: Actually, for a a silent graphic novel series, there is a ton of writing I do. Before I draw anything, an entire book is plotted out with short bullet sentences explaining every beat of a story. After that is locked in, I create small thumbnail pencil drawings of each panel and page. From there I lay it out in a rough format on the computer. This is the exciting part for me because, even though it is crude, I can for the first time see how the story looks as a whole. As far as deciding how much page/panel length to give sections of the story, I really just go with what feels right. I trust my instincts. I have noticed my tendency is to over explain a bit in which I often go back and remove panels and simplify a bit. I have also done the opposite and added pages into parts of the story to savor the moments and smell the roses. 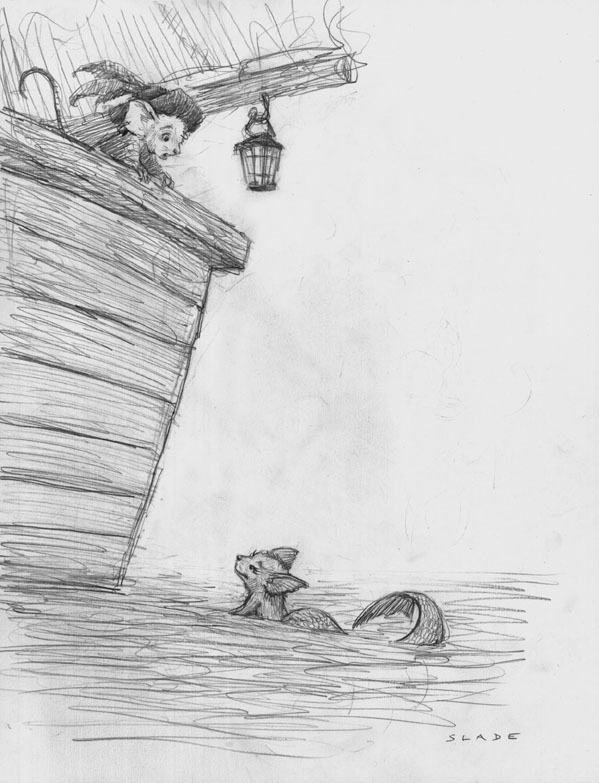 David: For your Legends of the Guard story, you tell a tale about a sailing-mouse who falls in love with a mermouse. 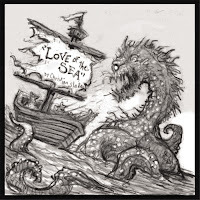 Without spoiling the story can you describe where this story came from and what you wanted to touch on while there. Christian: We discussed previous entries in this series over the phone and it sounded like romance tales where not really covered that much. So I thought that would be fun. Plus I spent a greta deal of my childhood at the beach, even living right next to it for a great stretch. I feel it is a subject that often calls for me. I am always excited when this setting comes up in my art projects. It seemed like a natural place to stage this tale. David: When it was time to do the final art for this story, what was your process? Christian: For this story, I actually did all the rough in digital format which was new for me for a comic story. I feel the computer gives me more freedom and tools to edit and change things very quickly. In fact I have done all of my roughs digitally for the last 4 years or so. It is sad really because I like having rough original drawings at the end of projects. That said I would rather spend that extra time on the final artwork instead. The only project I still draw my roughs traditionally is Korgi because I like to work on that while I am outside or traveling. David: Who would you cite as creative influences? and feel free to venture outside the realm of illustrators or 2D artists into directors, sculptors, etc. Christian: My creative influences are too numerous to name here but I will throw a few out there: Albert Dorne, Norman Rockwell, Franklin Booth, Heinrich Kley, Rein Poortvliet, Walt Disney, Herb Ryman, Ralph McQuarrie, Graham Ingels, Eyvind Earle, Harry Rountree, Corot, Rembrandt, Franz Hals.....too many artists I enjoy. That said, artists as a source of inspiration are nothing compared to real life. My BIGGEST influences are the wonderful people in my family. My awesome wife Ann and our twin children Nate and Kate, our Welsh corigs Penny and Leo and all the inspiring places we visit....those are the things I truly love. Drawing and artmaking is more of an addiction and one I gladly partake in on a daily basis, but it is the people and places in this world, and the time spent there, that matter the most to me. David: Christian, I appreciate your story and your time. Where should folks go to keep up with you and your work? 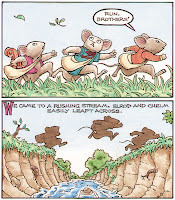 Christian: I actually just finished building a new website which has a blog and a portfolio at www.christianslade.com Thanks for the opportunity to work on a Mouse Guard story David. It was a lot of fun and I hope the readers enjoy it. volume 2 #2 along with stories by Jemma Salume & Rick Geary. Even though we still have issues of Legends of the Guard Vol 2 to be released, Today I'll walk through my cover for the hardcover collection of the second volume of Legends of the Guard. On the left is the final cover, with border and logo, and credits. 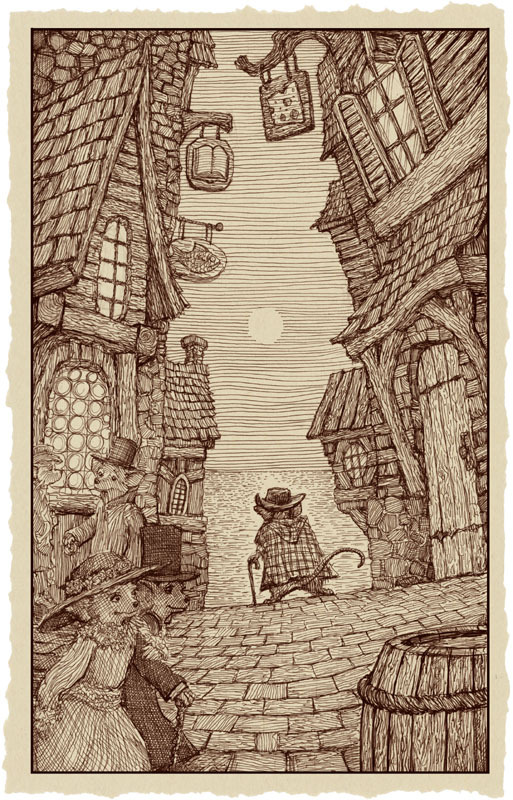 But first I started with an idea for the cover of "a mouse peddling goods involved in a race against another peddler or a predator". It took some suggestions from friends and my wife Julia before it shaped into "two guardmice with a cart harnessed to a quail fleeing minks"
First up, I wanted to design the cart. I looked at a few medieval era cart drawings and recreations, but decided I'd rather scratch build something myself to get a feel for it. 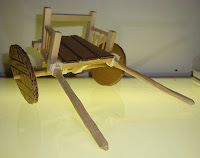 I used scrap basswood (they sell bags of it at the hardware store) to frame up the cart, lashed it together with string, and used some cardboard for the planks & wheels. I like building models this way (opposed to digitally) because it gives me a reason to push away from the computer, use my hands and engage my brain in not just a design sense, but a construction sense. How it's assembled is as important to me as what it looks like in the end. 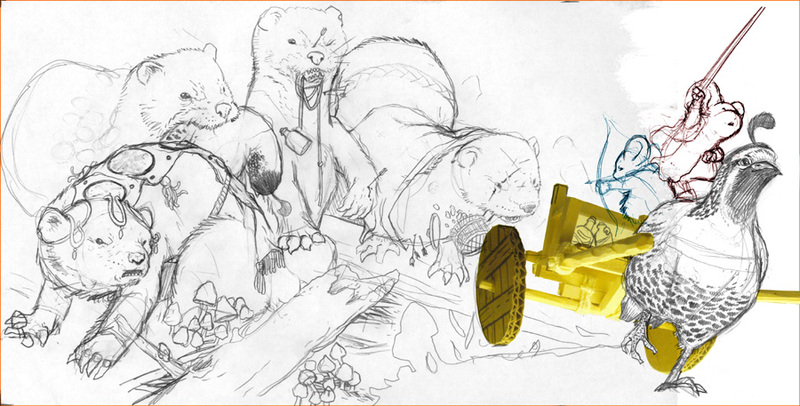 I sketched out a quail, several minks, and the guard mice and assembled them in photoshop with a photo of the cart in the position I wanted. I struggled back and forth on what the minks should look like...should they wear clothes? if so, what type. I've only shown one mink before (Black Axe #4) and I drew it without clothing...but I felt these four needed needed them, not just to convey intelligence, but as a design choice to add some color and eye-lures to move the readers eye across the image better. I printed out the above digital composite and taped it to the back of my Strathmore 300 series bristol. and then inked the piece on a lightbox using the printout as a guide. As you can see, I did a lot of the work in the ink. 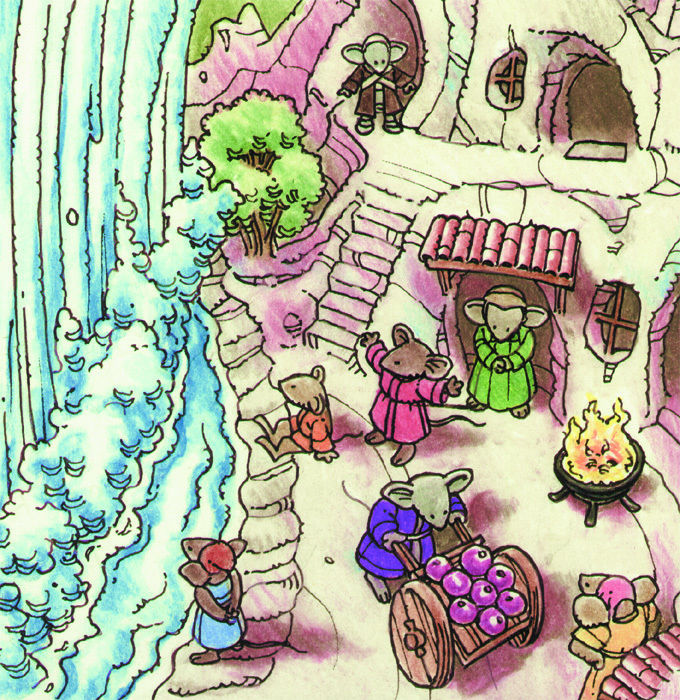 The mushrooms became so prominent because a fan tweeted to me that they'd like to see me draw more of them (they asked for morels, which I thought were too fussy with detail on this scale), so the guardmice now had a job of harvesting mushrooms. The last step was to color the piece. I wanted to gain back the obvious 'up on one wheel' speed and fury the quail cart was going, so I added a color hold to all the inkwork behind the little ridge they are coming up over. Other than that, I colored this in my normal way, flatting in colors first and then using the dodge and burn tools to render each part and add texture. 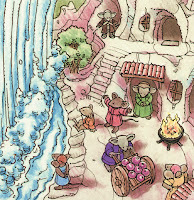 The overall palette is a bit more monochromatic that some of my past Mouse Guard work, but I'm aiming to be more subtle with color and not beat you over the head with it. I'm really proud of this second round of Legends of the Guard. I think the contributors did a fantastic job. I hope you all enjoy the hardcover when it comes out later this year, and that you enjoy the one paragraph story that accompanies this cover. David Petersen: Rick, Thanks for doing the interview and for creating such a great story for Legends of the Guard! You are best known for your series of true-crime graphic novels set in the 19th and early 20th centuries. I know you do a tremendous amount of research for those real events, people, locations, and timelines. With Legends of the Guard, I asked you to create an original story. How often do you get to flex that writing muscle? Rick Geary: I don't get to flex it very often, and I'm very grateful for this chance. In addition, the Legends story gave me the chance to do a little research into Medieval costumes and paraphernalia. 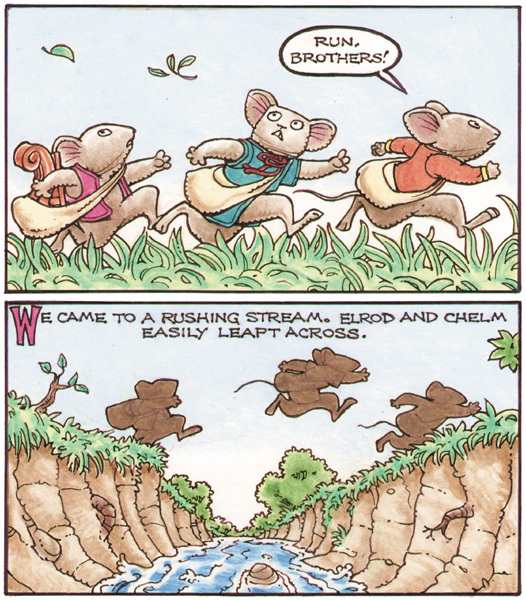 David: As fans of Mouse Guard have heard before, it was discovering one of your books in my local library that made me re-think doing comics. I saw all your hatching and stippling and patterns and felt a printmaking kinship to that inkwork that felt like things I did, but didn’t see in comics (so thank you!). 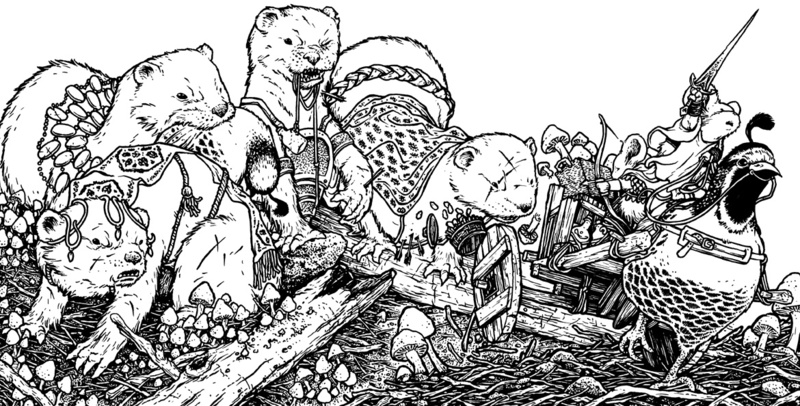 Did your sense of linework and pattern-for-tone arrive through some natural development? or were there other artists or processes that influenced that look? Rick: I don't believe that my ink style developed through any kind of conscious process. The most I can say is that I try for a certain tone or texture and I know it when I see it. The artists i consider my influences are too numerous to list completely. 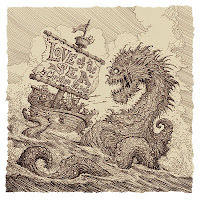 Edward Gorey, Robert Crumb, Gary Gianni, Tony Millionaire are some of the more contemporary ones. I also revere those pen-and-ink artists of the early 20th century: Charles Dana Gibson, Windsor McCay, Franklin Booth, Gluyas Williams, W. Heath Robinson. See? Too many to mention. David: How did you start down the path of tackling true crimes as non-fiction comic stories? Rick: I date my interest in true crime back to the early 70's in Wichita, Kansas, when a friend of mine, a former cop, lent me the complete case file of an unsolved murder from a few years earlier. 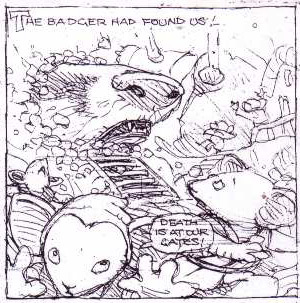 I studied it in utter fascination, and it became the basis, years later, for my first published comic story. The idea of telling the stories of unsolved murders, laying out the clues and the various paths of investigation, stuck with me, and I did a few short stories for different comic anthology publications before landing with NBM in the late 80's and starting the Treasury series. David: Did you have any concerns about trying to find an audience or publisher for your style of story and artwork in this comic marketplace dominated by cape and cowl superheroes? Rick: I've been lucky in that I've worked with the same publisher (NBM) for over 20 years, and have been able to establish a little niche for myself in the true crime genre. 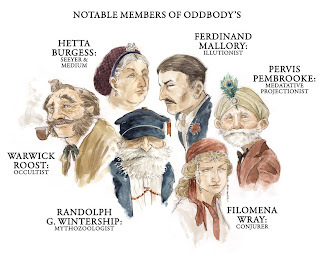 Non-fiction comics are assuredly a small corner of publishing, but the genre has been growing and attracting readers in recent years, and I've had the opportunity to work on historical and biographical projects outside my Treasury of Murder series. 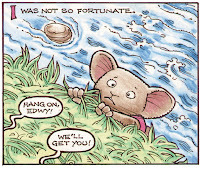 David: Your story for Legends of the Guard starts with an adventuresome young mouse exploring the tall grassy areas by streams near his home and discovering ‘treasures’. Did you have similar adventures growing up in Wichita, Kansas? Rick: Hmm. I've never thought of that before. I enjoyed growing up in Kansas, and, though I've never been much of an outdoorsy person, I feel a sort of spiritual connection to the prairie. This has probably shown up in my stories in various ways, but it's not a conscious thing. David: How do you start work on a story like this Legends story? Does it start with a script first, or do you thumbnail create the dialogue & narration later? Rick: I always start with as complete a script as possible, and the visuals grow out of it. David: When you start on the artwork, what is your process and what materials are your tried and true favorites? Rick: My method has become so standardized over the years that by now it's set in stone. I like to start with a pretty detailed pencil rough, and then I do a simple preliminary ink line over it with a thick-tipped pen, and then erase the pencils, and fill in the solid black areas with a Sharpie. Finally I do the finished ink work with a #0 or #1 Rapidograph pen. Rick: I always use Prismacolor Pencils for the (rare) color work I do. I'm not very confident with a brush, and the pencils give me the control I need, plus they can be blended to give a nice painterly effect. When I hand color a piece, that always changes the way I do the ink line over it. With the color, I try to supply the textures and shadings that I usually reserve for the linework. David: Do you listen to or watch anything special while working? Rick: Sometimes I listen to music (mostly Classical), sometimes I have the TV on, mostly old movies or old episodes of Criminal Minds or CSI Miami, mindless stuff that I don't have to pay strict attention to. David: Thank you again Rick, I really appreciate it. 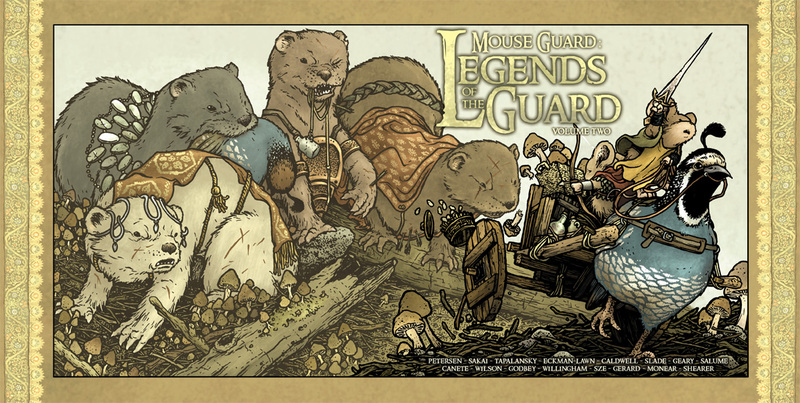 It was a thrill for me when you agreed to do this Legends of the Guard story. So we can direct people to more of your work, where can people find out more about Rick Geary and your books? I want to stop right here and say that the images and story I created for this pitch were for the pitch alone and not a project I plan to work on. 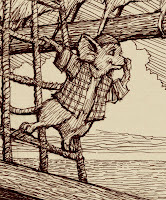 Though I've talked about taking a mouse-break before getting to The Weasel War of 1149, this is not a project I would or could tackle alone or in that time. Half of the challenge I already had an opinion on. 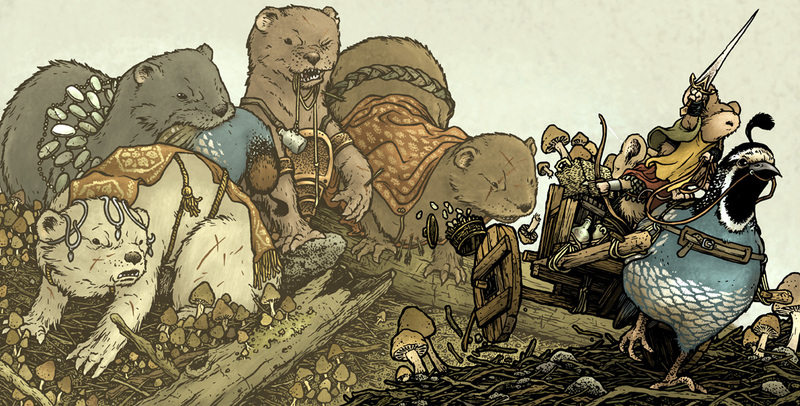 I've been focused on printed books being art objects since Mouse Guard started coming out in hardcover format. I believe that as the digital shift happens, printed material will need to be more than just a physical content folder, but concerned with design, paper quality, production, format, and presentation. I used two books in the start of my pitch as examples of how I wanted my idea to be expressed. 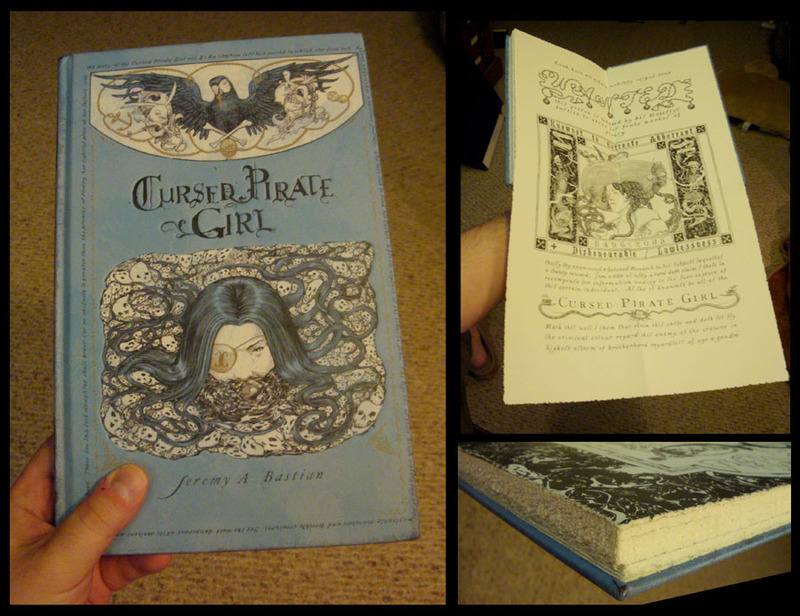 Cursed Pirate Girl by Jeremy Bastian & the Gryphon & Sabine books by Nick Bantock. 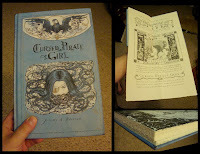 Jeremy's book has beautiful production value with it's cover design and deckled edges, but it's standout feature is a fold out wanted poster that you are instructed by a character in the book to unfold. 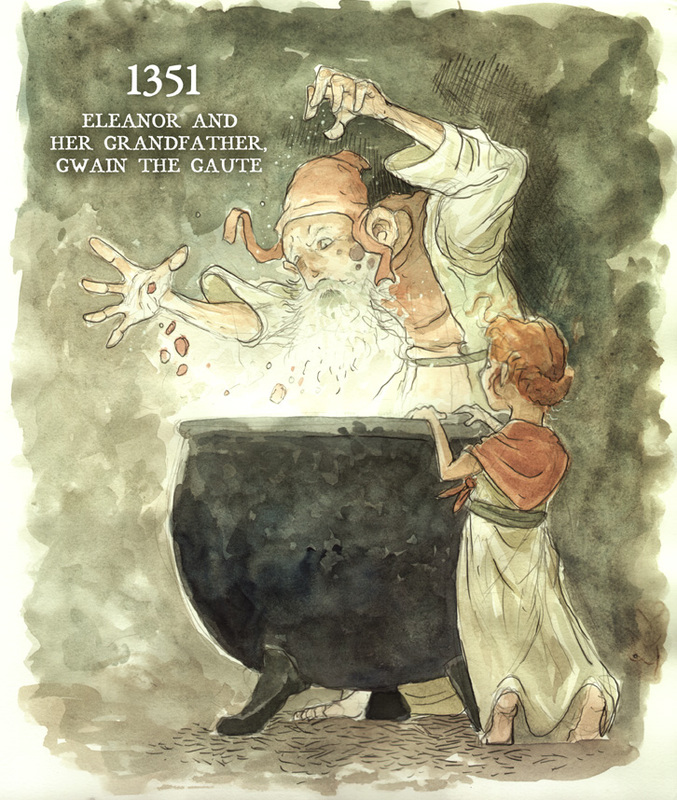 Eleanor is a young girl living in the middle ages. She isn't a princess or come from a traditional trades family...her kin are all seers, bone rollers, soothsayers, potion brewers, medieval barbers, and Oracles. These are odd folks even for the times, but Eleanor is proud to be with them and to learn the family business. Art Notes: I never do well with drawing any face meant to be pretty. So I drew & painted these Eleanor character pieces based on photos of my niece Kate. 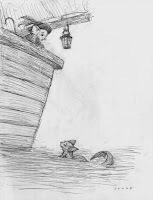 Art Notes: This was the first piece I did for the pitch. I had fun with the lighting effects and Gwain's hands. This drawing also established Eleanor's costume for the other images, something I wished I'd designed a bit differently as I went, as it's a bit boring. 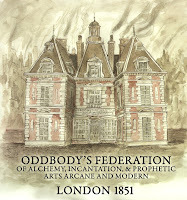 Eleanor emerges from her grandfather's conjured smoke and mist to emerge in 1851 London in front of "Oddbody's Federation of Alchemy, Incantation, & Prophetic Arts Arcane and Modern.". 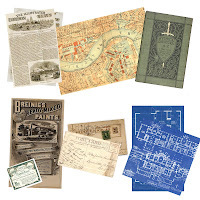 It is a place most Londoners ignore and see as a shop for the deranged or as a talent office for novelty seances, card tricksters, and parlor magicians. 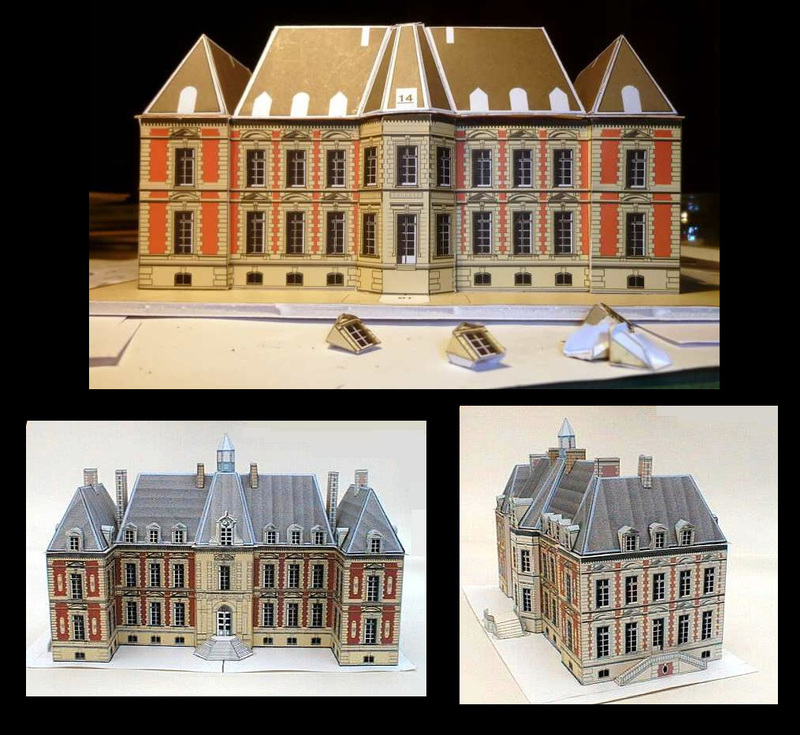 Art Notes: I based this building on a real french castle (the reason for which I'll explain later) but altered it to make it less royal and more cozy. 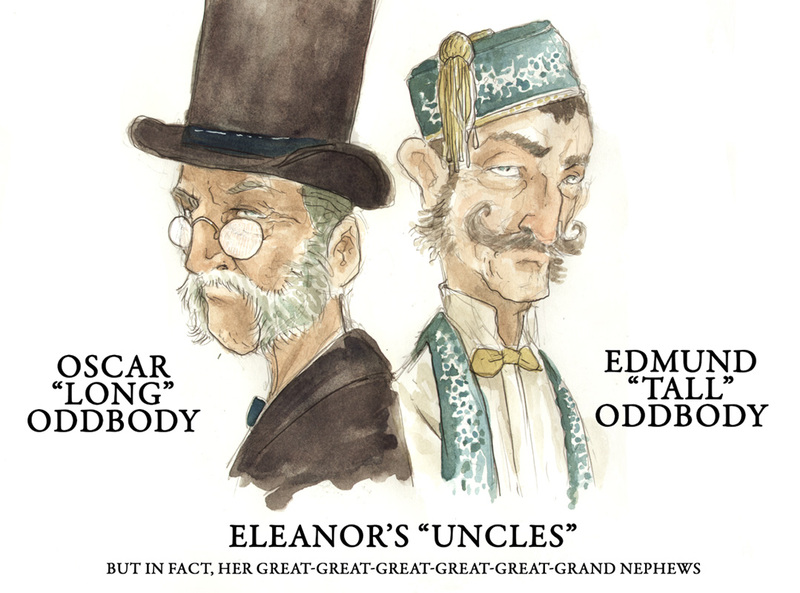 Oddbody's is run by characters who, in the story, would be referred to as Eleanor's uncles, but who are in-fact her great great great great great grand nephews: Oscar "Long" Oddbody and Edmund "Tall" Oddbody. 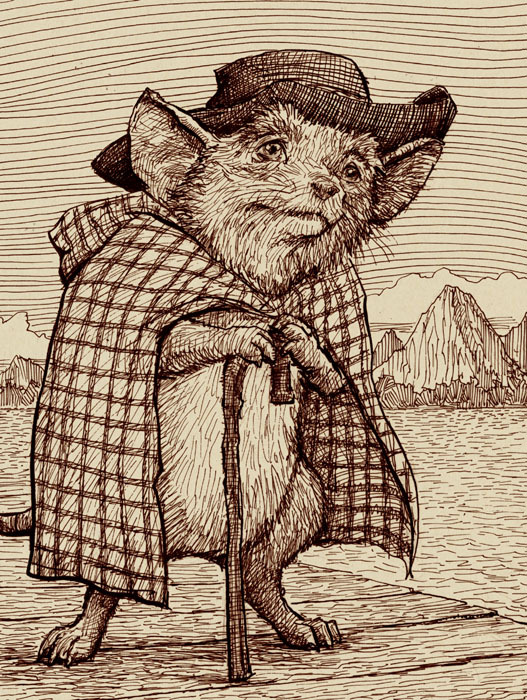 They give Eleanor mixed news on her arrival, that the cure to the plague is to eliminate the rodents and their fleas and to wash with soap....and also that they, even with their vast resources at Oddbody's, have no knowledge of time-travel magic. And so Eleanor is stuck in 1851 with no way to cure or see her family. 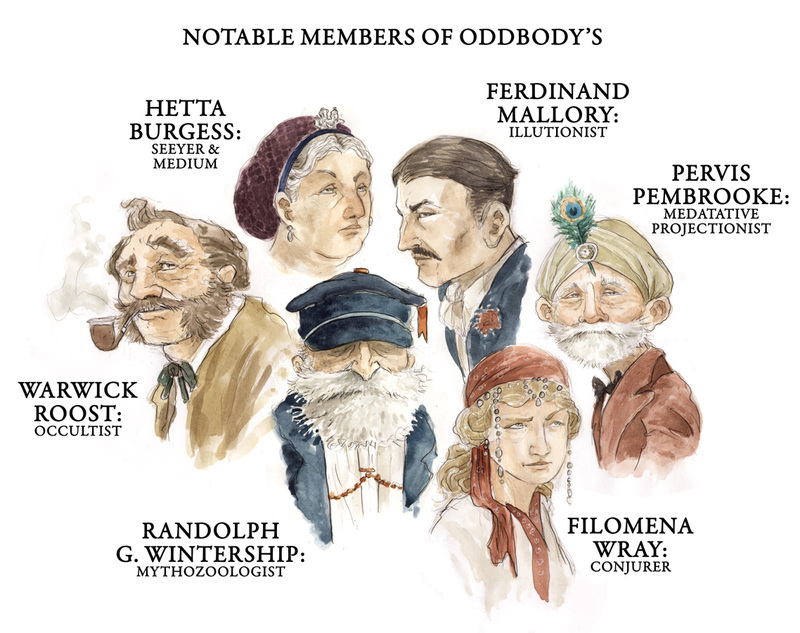 Art Notes: I'm rather fond of my design for Edmund, but Oscar is a bit too monochrome. My goal was to show a more laid back "uncle" and another who is more rigid. Not with a Bert & Ernie range in temperament, but with a few of those characteristics working on a subtle level. 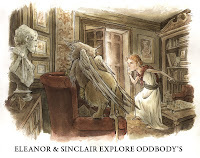 Eleanor arrives at a time of "magical upheaval" in which her uncles, as well as all the notable members of Oddbody's have no time for her. They can not properly train her in any magic arts, they are too busy huddled around tables, shooing her away, looking into crystal balls while asking her to be silent, and locking her out of rooms as they conduct group magic to deal with some major problem which is unknown to Eleanor. This being the age of child labor though, they don't think it harmful at all to magically bind Eleanor to the building (it's for her own protection) and have her mend, clean, wash, and organize Oddbody's. Her chores do give her a bit of insight into their world though, she is asked to re-copy ancient texts (which is well suited to her since her handwriting matches perfectly) and to care for and feed the unusual creatures there. 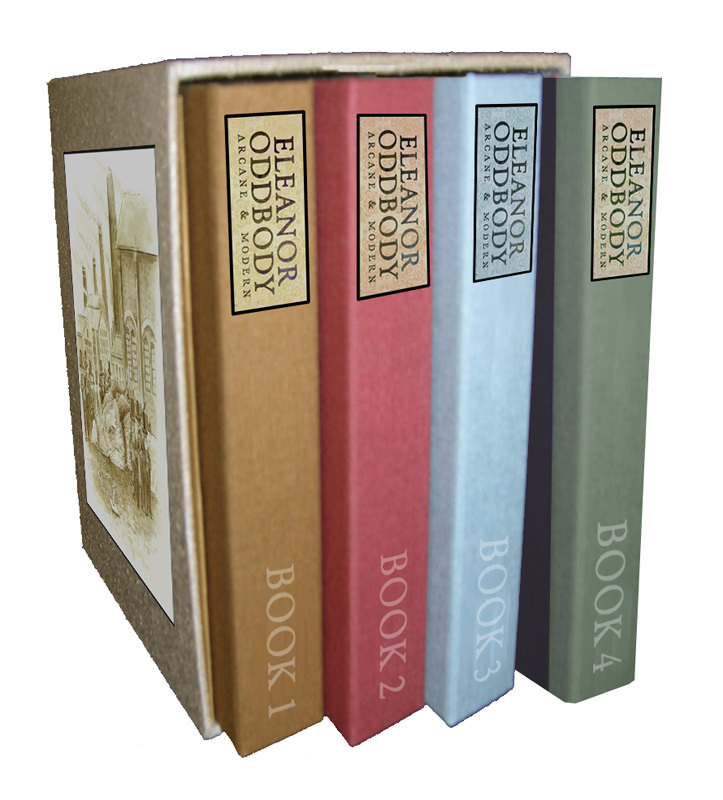 Oddbody's proves to be a lonely place for Eleanor. It's not that the adults are mean or cruel like in a Roald Dahl book, they just are very very busy with important work and there are no children around for her to interact with. 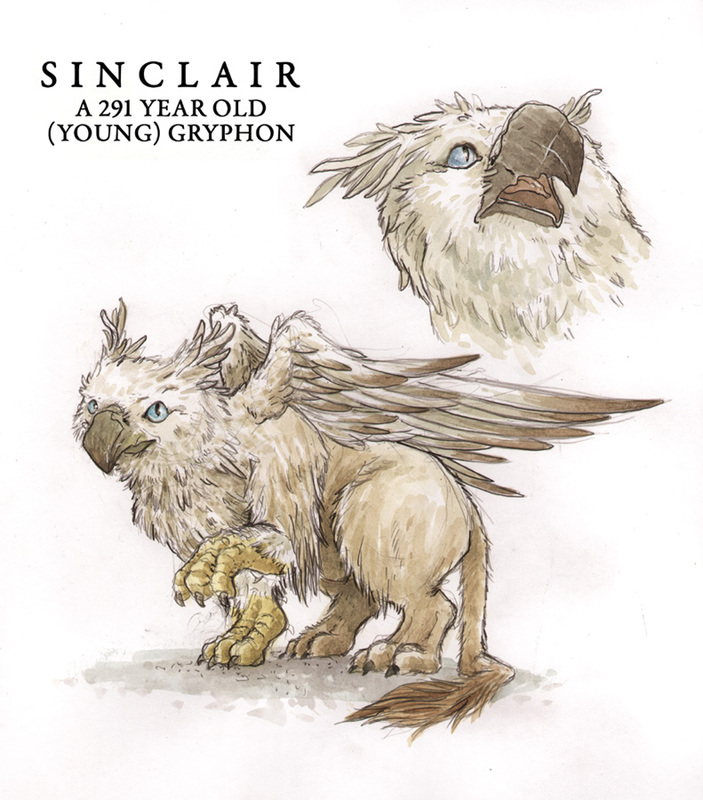 The only friend 'her age' is a 291 year-old Gryphon named Sinclair. Sinclair doesn't speak, but interacts with Eleanor all the same and is about the size of a large dog. Art Notes: This is the second pass at Sinclair. The first version didn't have enough bird cues in the face design leaving it to not feel like a gryphon at all, and was overall a lion-ish yellow color. This version has more of a mixed animal feel and I prefer this coloration. 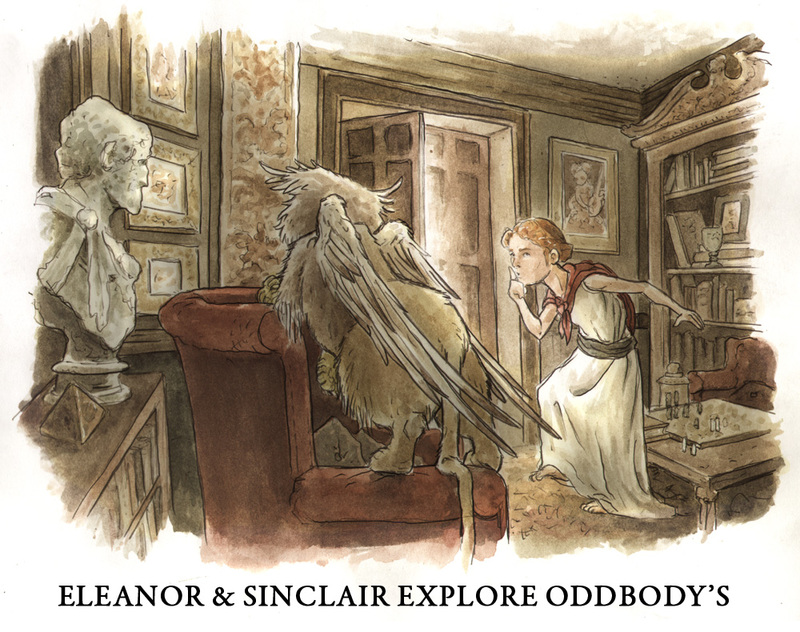 While left unsupervised, Eleanor and Sinclair explore the archive of magical knowledge at Oddbody's. They look for any way to send Eleanor home, they eavesdrop to find out what the "magical upheaval" is, and they research to discover what ever became of her family from 500 years ago. 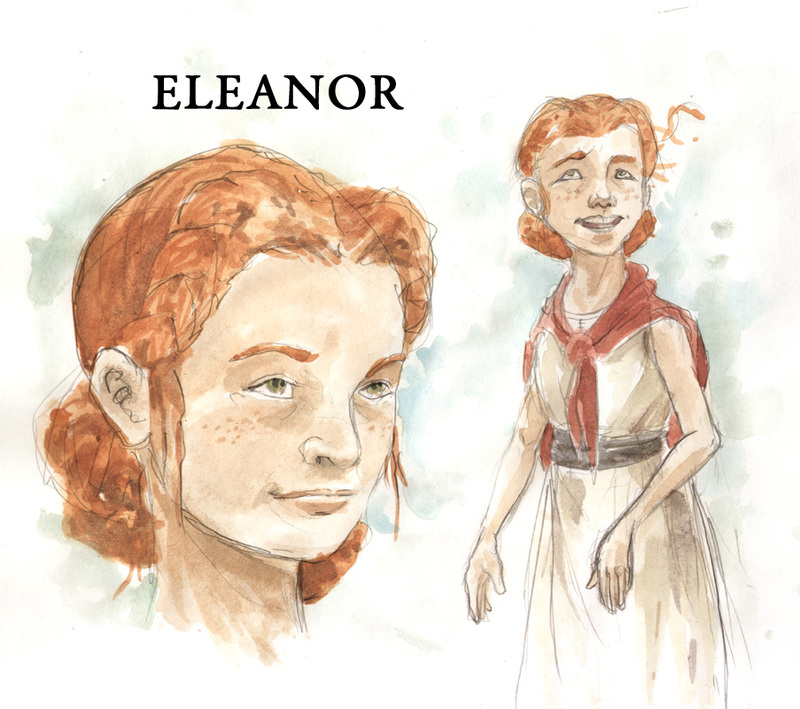 Eleanor becomes the curious kid detective character of classic children's literature, and as the reader, you are along for the ride watching the mysteries unfold. Art Notes: This piece really sums up the feel of the project for me. It's kids and pets being more inventive and intelligent than adults give them credit for and the level of mischief those qualities can get them into. 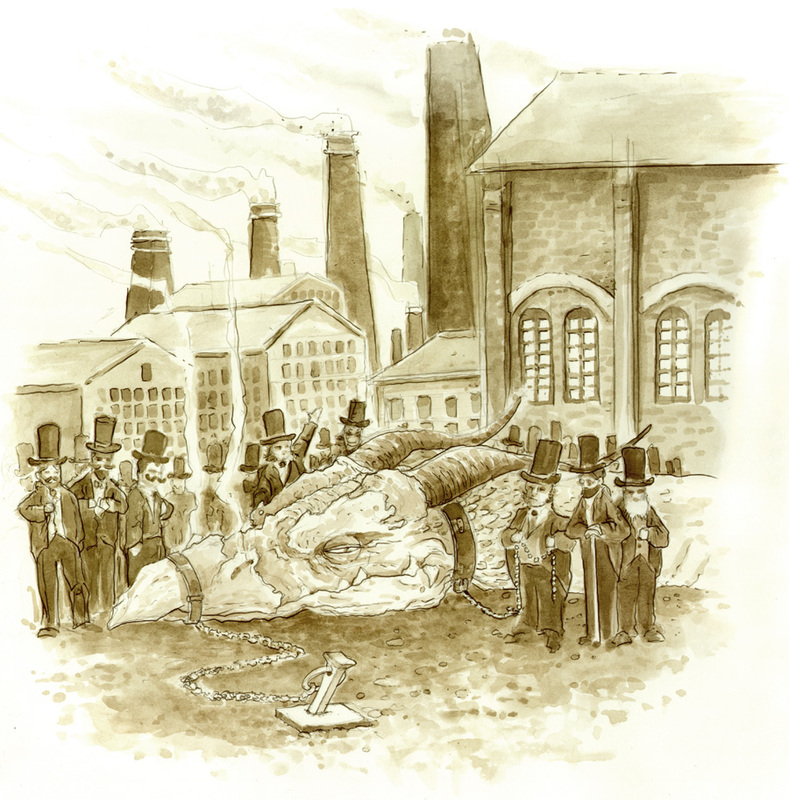 As the book unfolds, we, along with Eleanor, find that a group of industrialists have harnessed a dragon while it slept and are using it to literally fuel the industrial revolution. 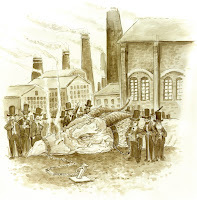 All the heat and fire used to smelt, cast, harden and forge all the metal of that era is being provided by this beast (who had woken up briefly in the 1600's and sneezed to cause the fire of London). 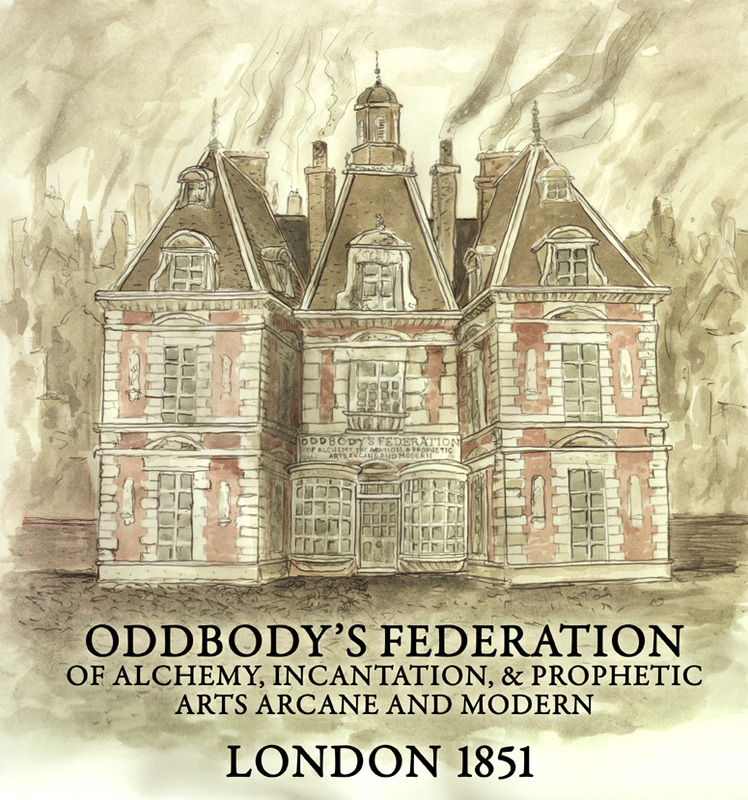 Clearly, Oddbody's Federation members are so occupied with this because they are terrified that such a powerful and intelligent magical creature is under the unqualified care & false control of the non-magical world. Art Notes: I have to thank Cory Godbey for this one. He gave me this idea, and I did my best to capture it as a sepia-toned old photograph. Here is where I get back to the pitch's challenge. To embrace the qualities of print, each book in this series would contain inserts, booklets, and fold-outs. But so that it's not a gimmick, each piece would have content that is important to the story and needs to be read. 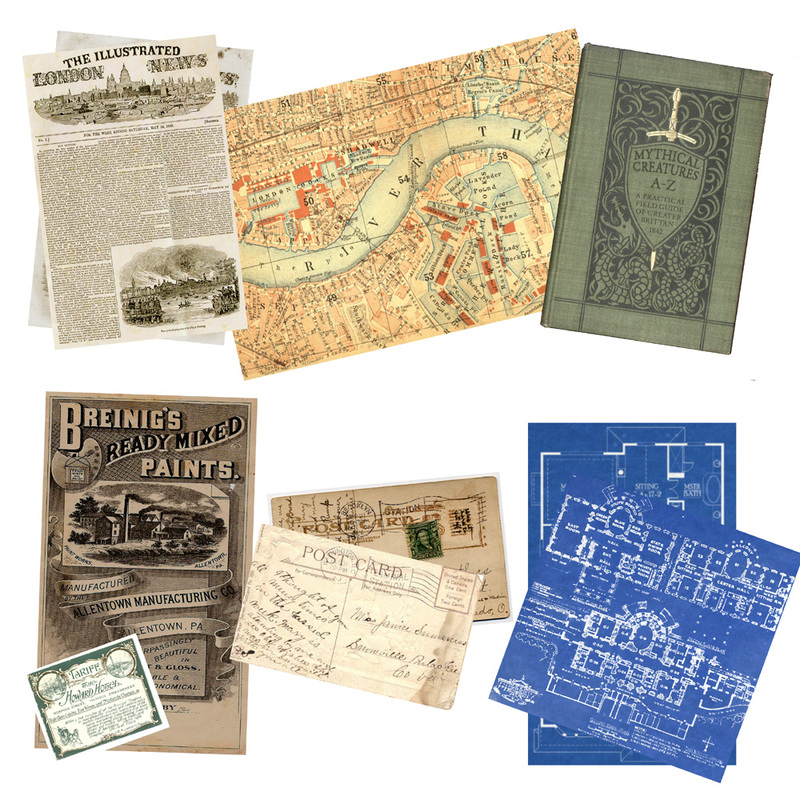 Newspapers with articles mentioned in the stores (and personal ads on the back that perhaps give character insights and clues) Maps of London with character's annotations, booklets showcasing a peek into Oddbody's library (complete with watermarks that provide hints), clues & bits of advertising, postcards (written & sent by Eleanor's grandfather who has followed her into the future, but is still 50 years behind her), and blueprints of Oddbody's iteslf. 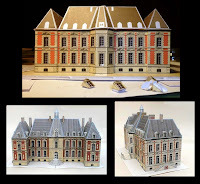 Art Notes: For the pitch, I found this papermodel of a real French castle that felt like it could be a basis for Oddbody's before I did the exterior painting. 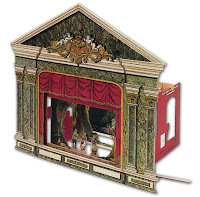 This way I didn't need to build a mock-up papermodel if I had designed something from scratch. 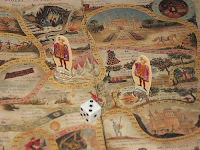 Two types of games would be included in the books. One would be a card game that could be played over and over. 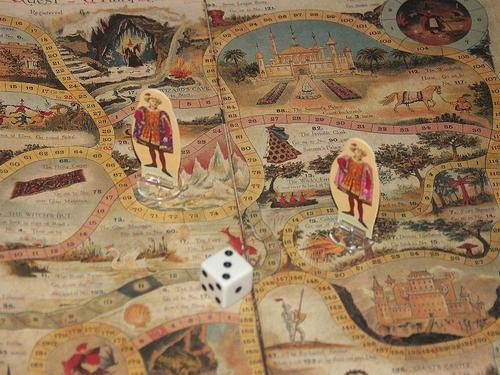 While this is mainly meant to get you further into the experience of the world of Eleanor Oddbody, the game's rules could help explain more about the scene in which it's played in the book. 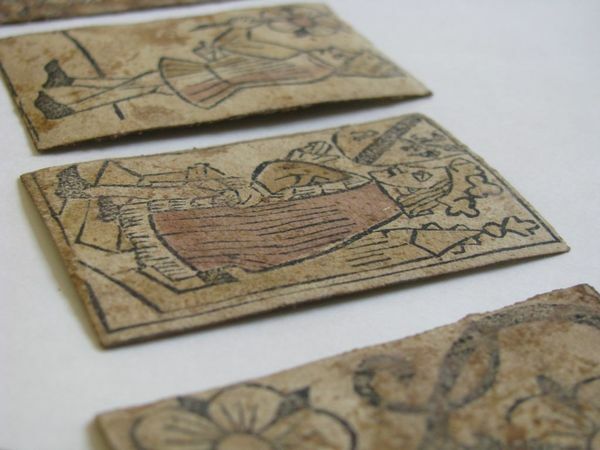 "Eleanor found the card game to be extremely fast paced and rather confusing to play"...well when you play the game and discover the cards are two sided and there are no 'turns', you can relate to Eleanor. The game would also have a bluffing, hand signals, or a social component to play...so this isn't a game that can be played as an app on a device, this is meant to be played in the presence of good company. The other game would be something akin to a blend of a traditional Role Playing Game and a Choose Your Own Adventure book. 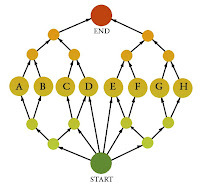 This also would be done in groups where players take on the role of characters in the book and determine how certain chapters of the story play out. 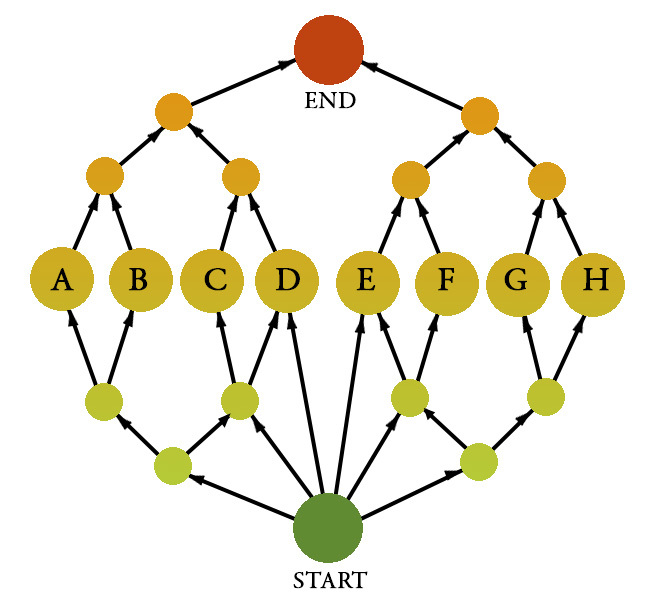 The players are guided through several (perhaps hundreds) of choices, but ultimately pass through a handful of plot options (A-H on the graphic)..and eventually funnel back down with fewer choices to the same end point. Each of the plots that can be explored would be referenced later in the books, but could be read at face-value to someone unfamiliar with the information from any given path. 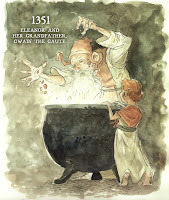 For example, perhaps route A deals with Eleanor getting, through seance, to witness the last moments of her father's life before he died from the plague...later in the book, there could be mention of Eleanor crying at the terrible vision of what her Father's end suffering would have been. If you had not played out the 'A' plot, you would still understand the story's text...but having played it, would have a deeper connection to her emotions. 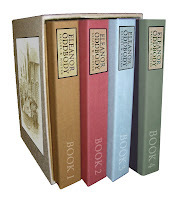 I see Eleanor Oddbody as a series of slim hardcovers (to keep production costs down and to encourage you to visit your local comic shop with each book's release) that could be packaged in a nice slipcase. An art object of a book series you would be happy to display in the main living space of your house. Something you could only experience in print and not digitally. 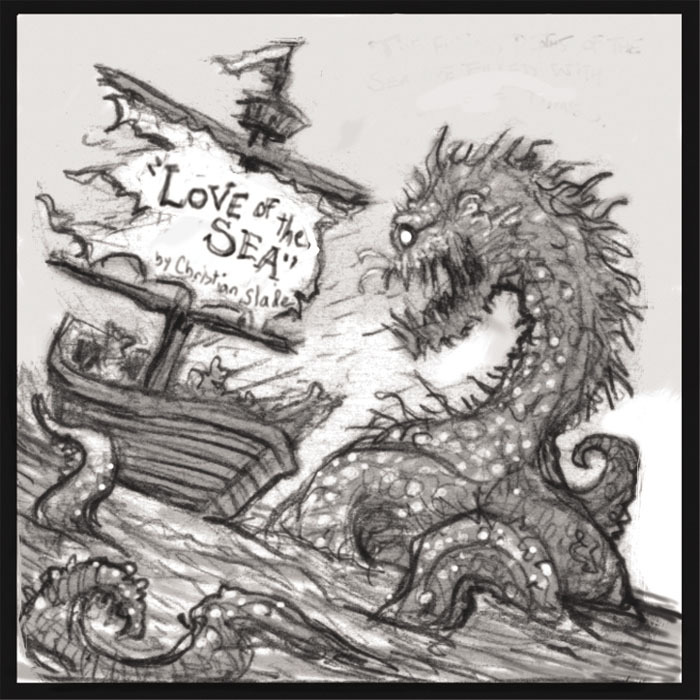 Something that satiates your love of collecting, story immersion, and, world building. Something you not only want to share with your friends who enjoy this type of material, but that you are encouraged to share. I think comic folks and lovers of fiction like this tend to feel very alone, like outcasts and on the fringes of society...but that isn't the case any more...we are like Eleanor, trying to find a way to a family that feels just beyond reach and to a modern world around us that we think ignores us...but the truth is, look at popular TV and movies, look at events like SDCC...there is a community of us, and the best place locally to find them is your local comic shop. At the end of the pitch panel, I received the most applause and won the panel for the second year in a row. I really do like this pitch and idea, but I know that I could not do this project alone, even if I wanted to. It would take a team of artists, writers, and designers and a very forward-thinking publisher (to see publishing something like this in an era of digital-is-the-future) to make this work. I'm not saying Eleanor will never see the light of day, but with my dedication to Mouse Guard, it will take the right people coming forward to make this work. While it's not up there yet, I believe MTV Geek will be posting the video of this panel on their site soon. Last week's watercolor pieces marked the 1 year anniversary of Watercolor Wednesday! And with 52 weeks of new paintings under my belt, I'm going to take a break from Watercolor Wednesday. 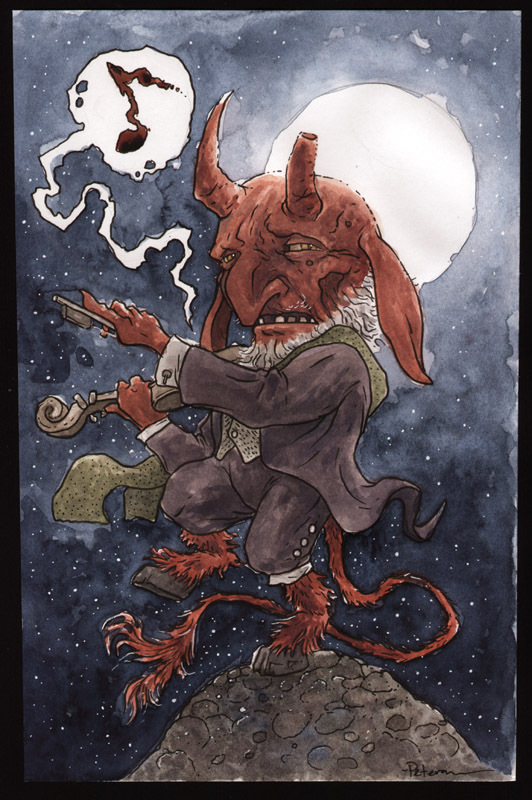 After a look back at last week's paintings, I'll explain what comes next...The first of the two paintings is titled 'old scratch' and was a play on making a fiddle playing devil who looks a bit frail and harmless (that's how he gets ya!). This is one of the larger Watercolor pieces I've offered for Watercolor Wednesday. 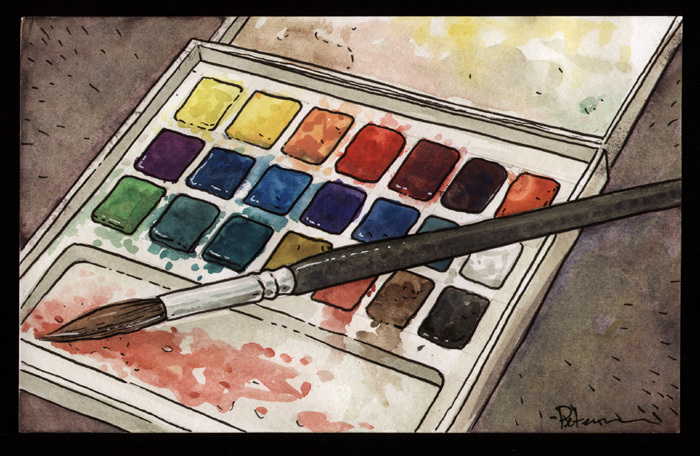 And the last watercolor for a while, is of my watercolor tray. I did the rough sketch for it when I didn't have my tray handy to look at, so it's not accurate to the number of cakes my set has (I have less). It felt appropriate as a way to round out this year-long experiment. So my plan is, to collect all of the non-copyrighted Watercolor pieces I did for this project and publish them in a nice little hardcover art book. I'm still in the planning stages of this project, but hope to have something ready before Christmas available for purchase. And I'll gladly start up Watercolor Wednesday again sometime soon-ish...but a year felt like a good place to rest. And then I'll measure out another 52 weeks from the point I start up again as a planned break. Thanks to everyone who participated in buying, spreading the word, and taking the time to look at my paintings this last year.